The winter is with us, welcome to the sunny days and cold evenings! The record at night during May and June has been -0.4°C! That really was a cold night. We all managed to survive with our warm clothes and steaming hot drinks around the fire from our boma (the area where we meet around the fire and watch the stars). But during the day the temperature easily reaches 30°C. The vegetation has changed too, the autumn colours surround us: red, orange and yellow, giving us such beautiful background pictures. These past two months involved a great deal of activities in Wild at Tuli. We were lucky enough to spot several young brown hyenas (Parahyaena brunnea) that have become more and more adventurous, not to mention reckless. They’re exploring more and more of their surroundings around their den, and allow us to watch them, much to the enjoyment of the volunteers and staff. Last night, while playing cards after a nice supper, we all heard the familiar sound of an impala and just after, an ominous growling. We shined our torches on the bush to see a leopard chasing an impala! The action was a fast few seconds but very intense. The leopard didn’t catch the impala but we could all hear the leopard retreating, his growls of displeasure very threatening. Of course, we also had some amazing sightings. We saw our well known ‘’Googly’’ honey badger (Mellivora capensis), five shy bush pigs (Potamochoerus larvatus) and two cape porcupine (Hystrix africaeaustralis) during one of our chilly sleep outs on our new hide. We also witnessed giraffes (Giraffa camelopardalis), common elands (Tragelaphus oryx) and lots of families of elephants (Loxodonta Africana). With so much work to do around the reserve between the research projects and the hard, physical work to maintain and improve the reserve, every day is a new adventure to learn more about the bush, the African wildlife and to keep our muscles warm. Thanks to our hard-working volunteers, we’ve made good progress in several of our projects. Big thanks to Leon Pauleikhoff for all the nice pictures. We hope that you enjoy this latest update and learn a lot of interesting facts about African wildlife and life in the bush. 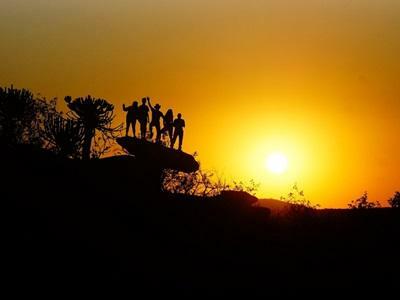 The bush is an everyday adventure, every day is different and we just can’t get enough! We’ve already identified 37 bulls and 18 herds (with 62 females identified) from the area of Wild at Tuli. African elephants (Loxodonta Africana) are the largest land mammals on earth; males can weigh up to six tonnes. A big male can eat up to 300kg a day (4-7% of its body weight) and drink more than 120 litres per day. They need to cover a lot of land to find all the food and water that they need. Between winter (dry season) and summer (rainy season) how the elephants spread out can vary depending on water and food sources. 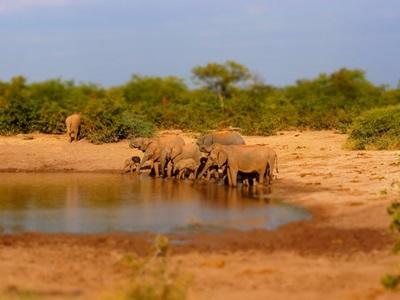 A lot of them tend to gather around waterholes in winter, which has a direct impact on the surrounding vegetation. Elephants live in a matriarchal society, with an old dominant female leading the way for her family to find the best feeding areas and waterholes. Females of the same family will stay together all their life; male elephants leave the maternal herd in adolescence (12-13, up to 20 years). The separation is a gradual process and adolescent bulls may become peripheral, following the family unit at a distance. When males are ready, they will become more solitary or group together as a bachelor group. We decided to start the identification of elephants (adult female for the families and mature bulls) to better understand their movements in the reserve through the year. Elephant identification is based on personal features, for example; ear notches, tusk shape, size and number, tail hairs and any distinguishing element that can help to recognise an elephant (missing piece of trunk, missing the tail etc.). This project is an interesting but complicated project which asks for accuracy and clear shots of the subject to make sure we are able to see all the personal features. The project is organised in two stages, first go in the field and look for elephants, take several pictures of them and try to see if they are already present in our elephant ID Kit. If not, we make sure we have all the pictures needed and on another day with the volunteers, we identify the family or the bull by creating and completing our data sheet. The volunteers really enjoyed the experience and learnt a lot of interesting facts about elephants, such as the difference in males and females, how to estimate the age and how to read the social behaviour in a family etc. 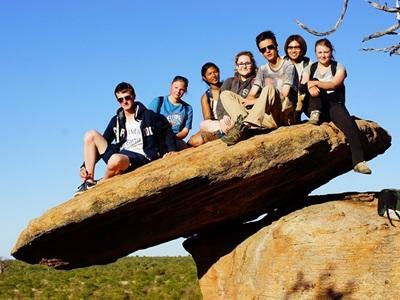 In September 2014, while doing some Kopje (translates from Afrikaans as “little head” and refers to a small hill made from rocks) climbing, we noticed some bones in front of an entrance to a den on the Kopje. We decide to install some cameras traps to see which animal was using the area. We were so happy when we discovered that the den was inhabited by the shy, nocturnal and rare brown hyena (Parahyaena brunnea). We discover later that it was a female and that she had just given birth to three adorable pups. 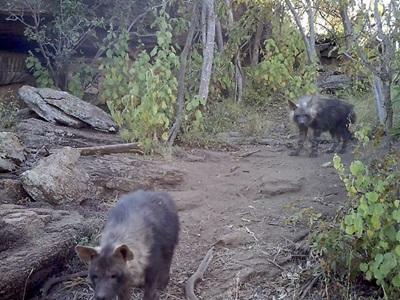 The three pups went out of the den for the first time on the 14th of October 2014, looking shaky and unsure about their walking and running techniques. Since this date, we have been monitoring and following the family. They stayed in their first den for 1.5 months, we never recorded any spotted hyenas sniffing around. On the 28 October 2014, they moved to another den and we found them again on the 14th of December. The new den is still in a Kopje, and we realised early on that one of the pups died. We do not know how but it could have been a snake bite, predators (spotted hyena, leopard etc.) or sickness that may have killed the baby. After that, they moved and changed den at least four times until today. They change dens for several reasons: security, food source, for a better place and because they can’t stay too long in the same place due to the parasites and sickness that can appear if animals stay too long in the same den. During the different periods, we have noted some interesting facts: spotted hyenas were coming daily to some of their dens to investigate and most probably try to eliminate the competition. We have seen the baby growing and becoming more and more independent, playing more around the outside of the den, travelling and discovering the area. We were also able to see different social behaviours between the mother and the pups, for example playing with the mum, suckling her etc. The mother brought back food, mainly legs of impala but also legs of young zebra or eland. Now, the two pups are around ten months old and they have started to be more independent, travelling together to find food, go drinking, investigating the different kopjes, playing together or showing interest in the volunteers when we have the chance to see them. To be part of the family is a real pleasure, seeing the pups growing, becoming independent and gregarious is just such an amazing experience. The permanent and temporary waterholes in the reserve often need maintenance. Dams and any water source play an important role in stocking up on water for the winter, which is the dry season here. Some of our dams are permanent (there is water throughout the year) and some are temporary and drawn from over the course of winter. A good dam needs to be waterproof across the bottom and sides and in good shape to work properly. Elephants (Loxodonta Africana) and other animals can affect whether the dam remains in good condition or not. Elephants are often seen walking along the edge and because of their weight (a big male can reach 6 tonnes), the edge can become weak and water can leak from it as a result. Elephants also like to play with mud and are quite messy drinkers, so our permanent waterhole can become unpleasant and filthy. Volunteers were motivated, and they accepted the challenge of cleaning the permanent waterhole with a smile. First we needed buckets to remove all the filthy water and after, we needed brooms to clean the waterhole. After a few hours of difficult work, we were happy to see some clear and tasty water coming in the waterhole. The next step was to protect the temporary waterhole with branches; some really huge branches were moved onto the side of the waterhole for maximum protection. All the volunteers worked really hard and the final job looked fantastic. We have been so lucky, as a new hide has been built. It’s with great excitement that we have taken possession of this marvellous construction. We are now able to do some nice sleep outs and watch the nocturnal wildlife, looking at animals coming for a drink or just passing by. Last week, we went again for a nice sleep out under the beautiful African sky and to see the amazing Milky Way. Even with some quite cold temperatures, close to 7°C, all volunteers and staff were excited for an incredible night. We were lucky to see many species, for example more than 20 elephants came to drink, five bush pigs, a fast brown hyena, a spotted hyena (Crocuta crocuta), two civets (Civettictis civetta), some plain zebras (Equus quagga) and greater kudu (Tragelaphus strepsiceros). We also heard two leopards (Panthera pardus) at the same time and a few spotted hyenas. What a night! Everybody was tired but we had a big smile the next day. The volunteers can’t wait for this rare experience to happen again.